Author of School Days, Holidays, and All Days That Lie Between, More School Days, Holidays, and All Days That Lie Between, Who Do You Love?, God's Calling You to Live a Life That's True, Trials of a Northeast Louisiana Child, her first novella,The School of Hard Knocks, Life Support, and The Refusal to Return to Slime. ISBN: 1467945277; Paperback; 122 pages.This is a poetry journal depicting a thug Donnie Stacks traveling from wrong to right. Donnie Stacks is recovered from death in a lifelong walk of pursuing false wealth. The stealth is lost from Satan and gets taken over by the power of God. A nice young lady Nicole Broussard warns Donnie repeatedly of his demise. Visions are seen over and over again that Donnie will get beaten to death by so-called friends. As a result, Donnie rejects what the young lady sees while he is still being used by the power of the enemy. Donnie finally sees that she was telling the truth when it is too late and powerful punches is on his plate. Donnie receives days in the hospital dying while his family is crying and calling out to Nikki who keeps responding that Donnie is doing okay, and that God had to fix him that way. After many days of family calling her to see about Donnie, she reports to hospital to see this prophecy fulfilled. Then many believe that true life support comes from God and God only, and that Donnie's life in God is real, and that the other life was phony. ISBN: 1460903579; Paperback; 220 pages. A young talented educator tries hard to maintain classes when disrespected by administrators in front of high school students at Westwood High School. The students have high performance scores on a predictor exam that is correlated to performance on high stakes assessments. Rude administrators harass and fail to support this young teacher with logically needed supplies to run the class. After numerous complaints she turns to God for assistance, God guides her via creativity. The leaders state that she is not teaching the subjects and that she was not disciplining the classes. Indeed that was strategy for her to be removed from the classroom many times but did not work. The students saw her publicly humiliated by leaders so they mimicked what they did and instead of the students being punished Ms. Nikki Broussard did. The second semester rolls in and Ms. Broussard is no longer employed and leaves in a way that was not following procedures. Nikki was deeply saddened by this event. Ms Broussard's status changes in many ways: Nikki gets world reknown as a poet, author,and teacher. The young educator gets paid double for her trouble for the trials that she faced at this school. She regains employment at Westwood High School as department head/ teacher of multidisciplinary sciences as many other events that God placed in her life story to get God's glory.This book includes activities, discussion questions, vocabulary, and poetry devised by Ms. Broussard. ISBN: 1451534981, Paperback, 88 pages, Poetry about unconditional love. An edited version of Who Do You Love? This book describes to the fullest unexpected unconditional love. 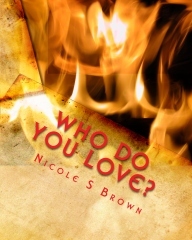 See the other version of Who Do You Love for excerpt and reviews. ISBN:144956609X , Paperback, 164 pages Poetry growing up in a region that is all around underprivileged. This book includes autobiographical poetry divided into two sections: my journey fleshly and my journey spiritually. The first section of this poetry collection gives details on how I viewed my growing up and the second section is how God intervened. In other words, this is my life in rhyme. No man can fill a void. Unless he loves his neighbor. This Poetry Collection details the life of poet and author, Nicole S. Brown, and her own personal trials and tribulations experienced while growing up in Monroe, Louisiana. The collection's subject matter is not for the faint of heart, as it spans many difficult and personal moments, which this author owns up to with grace and dignity, and in doing so, inspires her readers to take a deeper look at their own lives and ponder making changes. 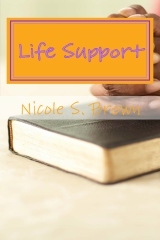 The topics covered in this journal are often written about in poetry... experiencing poverty and racism, or learning to love ones self and accept Gods plan for you... but Nicole's authoritative, candid and honest voice require a focused intensity that not only grab your attention and get your mind whirling, but let you see into her very soul. The poems range from quirky shorts to full page anthems. Sometimes light-hearted and simple, sometimes dark and painful, but also, often, awakening and enlightening. Her sophisticated, yet modern, writing style could easily be used in a classroom or book club type setting, but the easy readability could just as easily be enjoyed by poetry lovers, thus satisfying the needs of both educators and readers. Nicole S. Brown's Journals should definitely be in every poetry reader's permanent collection. She has a lot to teach and share through her poetry, and it should be enjoyed for generations to come. 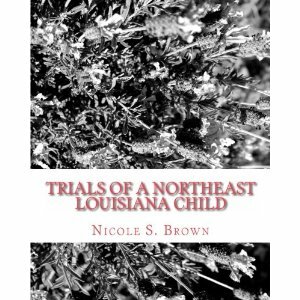 Author, Nicole S. Brown, once again claims her place as a great poet of her time, with The Trials of a Northeast Louisiana Child, Poetry Journal Collection. It's hard to imagine this author writing anything but exquisite poetry that not only takes you on an emotional journey, but dives into personal experiences and feelings that most people would never dare reveal to their closest friends or family, never mind the entire world. And yet this poet continues to open up her mind, body and soul, allowing us to see her inner most fears, desires, experiences, horrors, joys and epiphanies! I advise the reader to put on a comfy outfit, curl up on your favorite sofa, grab a refreshing beverage and plan on reading from start to finish. Because that is the best way to truly delve into this author's life and mind, experiencing the journey along with her; whether cheering, learning or sympathizing with her chosen path and life-lessons. And while reading this collection you might feel as though the author has written this collection directly for you, as trials fill each and every life, no matter how different your life-paths might be. By sharing her deepest emotional experiences she inspires the lost souls of this world...Those seeking a better road to love, life and God. A poetry collection definitely worthy of the permanent bookshelf! ISBN:1449983952, Paperback, 110 pages, More poetry about holidays and multiple subject matter. A sequel to School Days, Holidays, and All Days That Lie Between.This book of poetry would add pizzaz to any classroom. It has poetry for all students young and old. The topics range from basic grammar to general chemistry. More School Days has four sections that are titled:More Character Education with Social Studies; Marching In,Geaux Saints! ;More About Math and Science; and More Holidays and in Between with English Language Arts, Writing and Music. More School Days also has earned two 5 star reviews. In "More School Days, Holidays and All Days that Lie Between," Poet, Nicole S. Brown, writes not only with authority, but fun and vigor! Her writing is also just the right amount of enjoyment versus education. From simple three and four line poems that teach simple ways to remembers meanings (of various educational topics), to page long compositions with deep personal meaning, there is one word which can describe this diverse poetic collection: Passionate. And although the full collection deserves its accolades, especially notable is the section in which she shines light on the Saints Football team. Nicole captures the feelings and emotions of the Louisiana people and their love and pride for their team. It's truly believable that one of her poems, "Geaux Saints, (Who Dat, You Ain't) won an honorable mention in a Poetry Soup Competition. The entirety of the collection continues with themes both old and new. From building character, teaching and education, to getting down right technical, by poetically creating simple meanings to things and events. Such as time, trees, gravity, the elements, protons and neutrons... just to name a few. This collection runs the gamut on emotions and sends your mind into overdrive, and yet keeps you firmly in touch with reality. From fun and humorous to meaningful and educational ... She writes from the heart, no matter the topic, creating a stunning poetry collection. If possible, in the second volume of this poetry collection, Nicole S. Brown takes on even more subjects than in the first, and, unlike so many that do not meet the muster of their predecessors, this is a sequel worth reading! 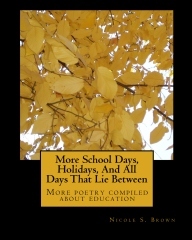 "More School Days, Holidays and all Days that Lie Between" is an exceptional array of various length poems that ignite and stir the emotions. 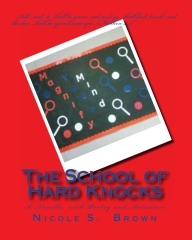 Its vivid wordplay makes for a meaningful and exciting reading experience. Again, this collection begins as simply enjoyable, thought-provoking and fun! And again, like the first volume, it is also an educational tool. Nicole writes on subjects ranging from English (taking on adverbs and adjectives), music, writing and teaching, to the pride felt by the Louisiana locals when it comes to their "Saints!" No subject is off limits! But, whether writing about Louisiana's favorite sports team, math, science, English or music, it's clear that this educator takes pride in every aspect of her writing, and it shows in every word she shares with us, her privileged readers. ISBN:1449560954, Paperback, 94 pages. Poetry about holidays and multiple subject matter.This book is Author Nicole A. Brown's first book published ever. The book is a definite must read for people of all ages. It contains poetry about holidays and many topics on academic subject matter. School Days has three sections which are General and Character Education; All About Math and Science; and Holidays and In Between. This book has an average review rating of 4.5. In "School Days, Holidays and all Days that Lie in Between," Poet, Nicole S. Brown, weaves a poetic interpretation of education, which is valuable not only to fans of poetry, but to both teachers and students alike. At first read, it's simply enjoyable. The imagery and prose evokes the reader into thought, remembrance and perhaps for the adult reader, even a bit of nostalgia. But as you delve deeper you realize that this poetry also takes another direction: a valuable teaching tool. The poetry collection is written in various lengths and rhythms, which can connect the reader to real life moments, in or out of a classroom setting. For teachers, these poems can be used to assist in educating students. Take for instance the section of poetry written expressly about math and science. It offers simple ways to remember definitions on various subject headings, like plants and animals, to liquids, gasses and solids ~poetry to help learn chemistry and biology~ a wonderful blend of literature and science. And for students, it not only assists in their classroom education, but also with lessons regarding daily life. Nicole's poetry tackles many subjects, from building personal character, holidays and heartfelt glances into daily life, to simply explaining topics like math and science. Her authoritative prose is clearly derived from her personal life experience and education in Monroe, Louisiana. "School Days, Holidays and all Days that Lie in Between" is definitely a collection you will want to pass down to future generations. Poet, Nicole S. Brown, creates small treasures that when all combined, total an unforgettable poetry anthology. It is clear that her heart and soul went into each word written in this collection. From an educational standpoint, she covers such topics as math and science, which both student and teacher will appreciate and value. She uses her learned knowledge to write poetry that will easily find a permanent home in any classroom. The poems are of various length and rhyme, describing topics ranging from plants and animals to chemistry and biology. Many of the poems are poignant, which could easily assist students in understanding lessons. But she also writes on topics like character building, holidays, reading, Patriotism and friendship...But each in a manner attune to detail, meter and imagery, which transports the reader, if even for a moment, to another place. She allows the reader into her mind, writing with raw clarity, humor, truth and daring. Both educators and poetry fans alike will want to add this collection to their permanent book shelves. ISBN:144956609X, Paperback,138 pages Poetry about a toxic relationship. This poetry collection would help people who are hurting or inspire people to stop destructive behaviors. This book is not recommended for children. This collection of poetry entails some rough times which proves that pain changes character. Author and Poet, Nicole S. Brown, known for such poetry collections as "School Days, Holidays and All Days that Lie Between," Volumes One and Two, takes a daring departure from educational poetry with an autobiographical collection detailing a tumultuous time in her life; a time in which she did something so many of us all do~ choose and take the wrong life path! A path that leads to heartache, pain and turmoil... But in the end sees this writer become a better and stronger woman! So vibrant and real is her writing that at the final page you feel like cheering, out loud! This poetry collection tells the intimate story about personal relationships that should never have been. And, that sometimes it's not enough to just say it's over. Sometimes it sticks around to haunt you, until you finally find the strength, self-love and respect to move on. It's a story that's been told repeatedly, but it's done with fervor and gut-wrenching honesty, without any pretense or fear. As a poet, Nicole always writes from the heart, but now, she writes about her own heart. Women seeking the courage to end a harmful relationship will find inspiration on these pages. And anyone that's ever had a difficult situation they needed to overcome can see eye-to-eye with this poet. The dedication says it all: "To all Individuals who have been hurt or are currently hurting." Sometimes life throws us lemons, and sometimes, making lemonade from these bitter fruit doesn't happen until the lemons have spoiled, rotted, rejoined the earth and are reborn once again as new lemons... Nicole S. Brown follows a similar difficult journey in the autobiographical poetry collection "All About Slime," as she openly and daringly writes about relationships that should have never begun, and, that would not end even when she knew it should be so. A story that sadly, many of us are all too familiar with; loving the wrong person, and not realizing it until the damage is already done! The real inspiration is reading the progression of bad, really bad, hitting rock bottom, and then watching Nicole rise above, endure and then bloom into the stronger woman she is today! If you're unfamiliar with this author's poetry you really should give it a read! She's not afraid to lay it all on the table... Even though it can be a vulnerable experience to do so. Being able to read poetry with such honesty is both delightful and enriching. The honesty allows us into the personal life of a complete stranger, and yet we may find we have a lot in common with this stranger. And then, as you read, this person doesn't seem like a stranger anymore. You feel you know her, intimately, and want desperately for her to regain control of her life and destiny! Whether you have ever been, or are currently in, a relationship or situation that is unhealthy, find solace in this author's bravery to rise above. Courage can be found in many places, and is often forged, by those in need of it, when others are brave enough to share their experiences with the world. So bravo, Nicole, for taking the bold path, and reminding us that it is possible to survive through the hard times, and not only live to tell the tale, but move on and live a stronger and better life! Before I had an identity. Can’t run and hide from him. Even when someone else comes around. A familiar tale: Falling in love when you least expect or desire it! Which means that not far behind is the inevitable mix of pleasure and pain, happiness and agony, melancholy and devotion, anger and forgiveness... Which hopefully will lead down the path to true and unconditional love. Nicole S. Brown, in "Who Do You Love?" gives us a poetry collection about the subject of unconditional love and the trials and tribulations it can bring to daily life. Love is not perfect and does not always happen when you want it to! Her poems bring this fervid topic to the written page, and in a manner which all readers can equally commiserate with. Each poem is written with a specific rhythm that further enhances the emotions portrayed. And often, readers can see the reflection of their own personal experiences, feelings and desires in the stories shared. Though this poetry is written on the subject of love between a man and woman, it can also be inspirational in other ways, as the ups and downs of love are similar to the tumultuous ride of anything loved in life- work, family, God. The relationship we have with ourselves and love is a topic that will never grow old. Love is not simple. But Nicole's poetic examination helps remind us all that the path to true and unconditional love is a road worth taking! And Nicole's poetry is a chance worth taking! Your only risk is falling for this author, heart and soul. "Who Do You Love?" by Nicole S. Brown, delves into one poets views on the subject of unconditional love ~ a love that not only hits you by surprise, but throws your life into both joy and upheaval. This poetry collection covers a classic theme that has been written about since humans first began writing, and no doubt will be written about until humans are no more: Love ~ and the roller coaster ride it sends you on once you take that hit from Cupids arrow. From pure ecstasy and pleasure, to denial, fear, confusion and anger, each poem strikes a nerve with anyone that's experienced requited or unrequited love... But always keeps to the overall theme of loving someone, unconditionally, even though it might not feel like the right time in one's life to accept love. It is easy to sympathize with this author's poetic analysis of the subject, as the range of emotions experienced becomes almost therapeutic; in that it allows the reader to recall their own love stories, and that we are not alone in this journey. It's a path all of us take at one time or another. "Who Do You Love?" is a magnificently sincere, and daringly honest, poetry collection, and one that will hit home with both fans of the genre, and people in love. This book of poetry follows the story of a man that is lost, struggling with the demons of his past, and facing a choice that will decide his future. Will he allow his demons to destroy him, or will he let God into his life and take the path that's true? As Poet, Nicole S. Brown, tackles such subjects as temptation, redemption, faith and destiny, devotees of poetry, as well as the bible, will find a wealth of inspiration on these pages, enough to last for years of not only pleasurable enjoyment, but spiritual reflection and debate. From moments of reflection and peace to moments of true fear and horror, and finally to the journey's end, the emotional fervor keeps the reader on their toes. Nicole writes with wonderful honesty and clear devotion to the subject matter. This poetry journal will make a fine addition to any book shelf collection, for those seeking their own spiritual journey, or for readers simply wanting to enjoy beautiful and heartfelt verse. 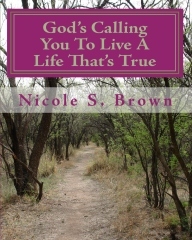 In the poetry journal "God's Calling You to a Life That's True," Author, Nicole S. Brown, entertains and uplifts us with the story of a man being called home to God. Any reader that has had their own spiritual journey back to God will agree that this story hits a home run! Each poem is accompanied by aptly chosen scripture, giving us a sneak peak into the spiritual life of the author herself. Her knowledge of the text is proven time and time again. The central theme follows a man with a sorted past that must confront it, in order to save his future and his soul. Through personal tribulations he must overcome and choose to accept God, thus fulfilling his true destiny and understanding that there is an overall plan for his life. Will he accept his path? Or will he choose to let his past destroy his future? Will his journey finally give him the inner peace he's been so desperately seeking all his life? These poems are simple to read and yet evoke personal debate and meditation. It's clear that there is meaning behind each and every word written in this story, as it applies the oldest of wisdom's, but in a modern, easy to understand meter. This book would be enjoyed around any table wishing to debate on the subjects of destiny and God's path for mankind, or anyone seeking an inspirational journey of their own. ISBN:145634711X, Paperback, 138 pages, Poetry about ten year toxic maningless relationship and how a woman obtained the courage to leave it. An edited version of All About Slime. This book describes how a woman depended on God to get out of a situation that was detrimental to her identity. 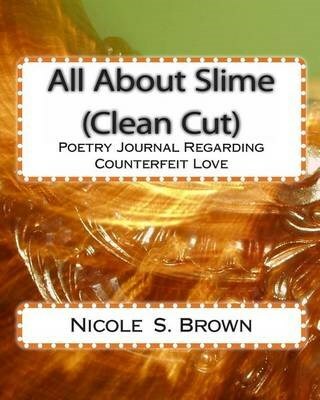 See the other version of All About Slime for excerpt and reviews. 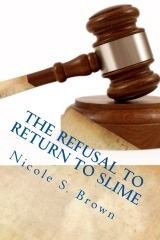 ISBN: 1497478561, Paperback, 242 pages,The Refusal to Return to Slime is another testimony of Author Nicole S. Brown. 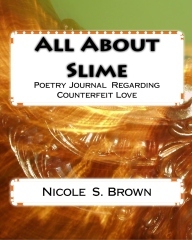 This poetry journal is a sequel to its predecessor, All About Slime, which is regarding a ten- year relationship with a man with who had a phobia toward commitment to her, but not two other women that share our genus and species. The Refusal to Return to Slime speaks of an attack that nearly killed her because this worldly successful man would not allow her to be with Jesus. She discovered that this attack was on her purpose and plans was orchestrated by this one man who stated that he never was involved with her (got married on her twice), fathered their lost child, or even loved her. He said that she was just a friend who tried to destroy his home and actually did it. 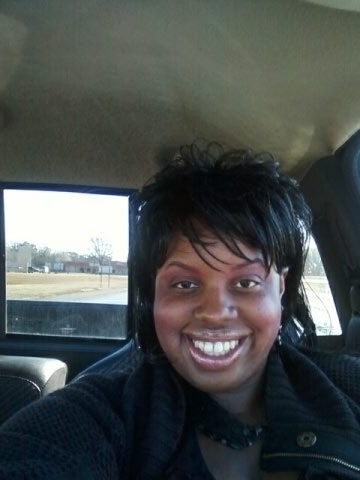 Once the love of her life who he never publicly acknowledged, a top Louisiana attorney from North Chicago, uses his former and current wives, their families and hers, state governmental agencies and entities, Greek letter organizations,legal organizations, and an alumni association in order to regain her (his ex-mistress of ten years). Dark secrets of betrayal and obsession are unleashed in this poetry journal. Witnessing to the guilty parties, moments of Author Nicole S. Brown’s despair, statements of forgiveness, and confessions of guilt among many other topics are rendered to the reader for a look into the lives of a nymphomaniac, money-hungry, powertripping, Louisiana attorney, his wives who supported his need for money, his ex- mistress (Author Nicole S. Brown- he was her only friend from college) who lovingly boosted his ego and loins, and the corruption of Louisiana government head on. After five years of separation and his attempt to gain her back, she still affirms to not being his scapegoat by not admitting to a lie that he claimed that she did: destroying his household. Nicole stands her ground firmly and states that he is the reason that his home was and is in the shape that it’s in…on shaky ground. Nicole with God’s help comes out ofthis situation a winner although it appeared to the world that she was a loser and a liar. The true loser and liar is who? Read on people to see. It is a man but it really is the enemy. This poetry journal includes visionary pieces as well as real encounters. It doesn’t state that she doesn’t love the man. It’s a refusal to return to dealing with his foolishness and his marital status. This story is not defamatory at all and its sole purpose is for God to get the glory. The only real name that is listed in this book is Author Nicole S.Brown. This is not the average Christian story. It hits real life and it does have language that may not be suitable to the average Christian. The Refusal to Return Slime is for mature audiences only and will be available worldwide on a stately day.